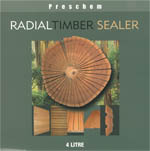 Radial Timber Sealer is a unique unpigmented oil based clear timber sealer combined with an effective mouldacide developed to provide short-term sealing and water repellency to Australian timber. (up to 6 months in exposed environments). It allows timber to weather naturally from UV exposure to a silver grey. The purpose of this application is to allow the moisture content throughout the timber to be controlled and stabilise as it settles into the new environment before the greying off process begins. Radial Timber Sealer is designed to be a one-off initial precoat for new hardwood and is recommended to be applied to all sides. It is suitable for hardwoods used for external cladding, window frames, fences, decking and pergolas. If preferred, the surface can be recoated with an oil based finish after installation if the freshly cut appearance is required. Ensure a clean dry surface, free from dirt, grease and wax. Greyed timber should first be cleaned with a suitable wood cleaner such as Preschem’s GREY DECK CLEANER. Brush spray or wipe one generous coat of RADIAL TIMBER SEALER on to the timber and allow 24 hours drying time. It can be applied by any convenient means, such as brush, roller, spray or dip application. Exterior floors or decks can be easily treated with a lamb’s wool applicator. If the timber still looks dry, another application may be required. A minimum of 24 hours drying time for decking and areas subject to foot traffic is advisable. Ensure all end grain wood is well coated to minimize water absorption. RADIAL TIMBER SEALER will remain water repellent for up to 12 months on fully exposed timber in most conditions. It is designed to a true one time only application on new timber. Note that it will lose water repellency over time. 4, 10 and 20 litre cans. Do not induce vomiting. Give a glass of water to drink and seek immediate medical attention. Do not give water to unconscious patient.